These low voltage wicker cone string lights are suitable for use both indoors and out, idea for garden parties and adding a little light to patios etc. 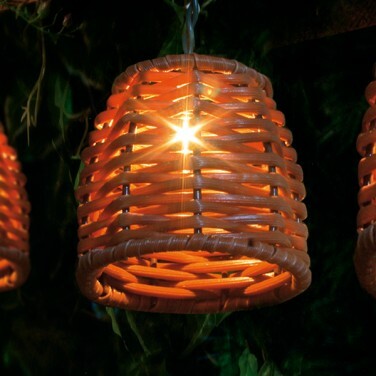 These wicker cone string lights are ideal for use indoors or out. Add a little style to your home or garden with these stylish low voltage string lights. 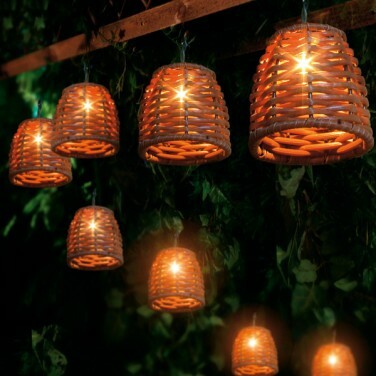 10 lamps spread out over approximately 2.2 metres, each featuring a brown wicker cone 'shade', provide miniature mood lighting for your home, patio or garden. Extra low voltage lamps with replaceable white bulbs make these string lights safe for use outdoors as well as in and they are ideal for decorating trellises, hedges, trees, parasols and patio furnature. Add a little style to your patio!